Haralson County did not quite trust groundhogs. Two days before Groundhog Day in 1968, the Tallapoosa Journal mentioned the usual superstitions of the little beasts seeing their shadow and the odds of an early spring. The Journal also was not too trusting of them, especially if a local one happened to make a prediction. Move that little rascal out to his natural home. While the Tallapoosa Journal was correct in that groundhogs were not native to Haralson County, the geography actually was not too far off, at least according to Wikipedia. A map of where groundhogs dwell show them at the very northern tip of Georgia, ranging perhaps as far south as Rising Fawn. There was no reason to disbelieve that one might have gotten utterly confused and kept going south. A description that could have doubled as a Ray Stevens song told the tale of the monkey’s brief life of freedom. It had supposedly escaped from a traveling circus in Barnesville. The monkey was first spotted in a tree near the home of Mrs. W.H. Etheridge. We’ll take it that either our first witness thought she was out of her mind or people she told thought so. Who expects to see a monkey in Monroe County? This conclusion is drawn because it wasn’t until the tailed wonder was sighted in the hen house of Otis Sanders that the hunt began. For three days, Monroe County citizens searched for the monkey. They wanted to capture it alive, probably out of a combination of curiosity and the rumor that the circus was offering $50 for for its return in that condition. Dogs were brought in to track the monkey, but because a) the dogs had never tracked a monkey before and b) “monkey was able to swing through the trees with the speed of a Tarzen [sic],” no dice. The decision was made to shoot to kill. Dumas shot the monkey and likely attained legendary status in Monroe County. This really isn’t that strange. There was actually a debate in many Georgia counties at this time about livestock fences. Maybe not to the extent of pigs scratching their backs on tombstones as can be visualized here, but major debate nonetheless. One, Irwin County, voted in July 1947 for “no fence,” which meant farmers did not have to fence in their crops and instead, livestock owners had to fence in their animals. “Irwin County joins the list of other progressive South Georgia counties which have restricted the wanderings of cows and hogs from the highways and farm lands,” according to The Ocilla Star. The Bulloch Times and Statesboro News poked fun at its own town in 1930, but it also showed that Statesboro was a much different place then. Then, as now, Statesboro was a college town, but South Georgia Teachers College was a year old. It was a name change from Georgia Normal School, which itself had been First District Agricultural and Mechanical from 1908-1924. 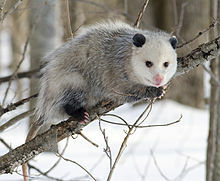 Note that the possum and the polecat were not small. “Master-sized,” said the Times and News of both animals. That’s beautiful use of the English language. Another circus story out of the city of Register, also in Bulloch County. A gentleman visiting this circus in 1927 tried to make friends with a hyena by sticking his hand in a cage. He was bitten. Hyenas don’t actually laugh. This one might have. Sources: The Tallapoosa Journal – Jan. 31, 1968; The Monroe Advertiser – Mar. 6, 1952; The Quitman Free Press – Feb. 10, 1949; The Ocilla Star – July 3, 1947; Bulloch Times and Statesboro News – Dec. 8, 1927, Nov. 20, 1930.